During perimenopause, estrogen levels are fluctuating, meaning that many women can experience perimenopause symptoms, including weight gain, depression, anxiety, lack of sleep, and osteoporosis. To control these symptoms, it's essential to lead an active lifestyle. Different kinds of activity will work for different women, but here are some sports to relieve some of the troubling side effects of perimenopause. Swimming is a low-impact sport, so it's easy on joints and bones. It can be a great way to spend quality time with your friends or family, or a solitary activity, developing strength and working your whole body. In the summer, swimming outdoors boosts your mood, since the sunshine will raise your levels of vitamin D, a natural mood balancer. Biking works your muscles, helping to prevent weight gain. You can try biking to work every morning instead of driving, or taking leisurely rides through the city or countryside. Yoga helps stave off feelings of depression and anxiety by relaxing your body and mind. As well as being psychologically beneficial, it also develops core body strength, balance, and coordination. By increasing your focus, stamina, and flexibility, it has the potential to improve not only perimenopause symptoms, but many areas of your life as well. This is a great cardio workout, raising your heart rate and releasing serotonin, a neurotransmitter responsible for feelings of happiness. Not only will this sport help conquer feelings of depression or anxiety, but also increase energy levels, combating feelings of fatigue. Engaging in cardiovascular activities has the added benefit of contributing to better sleep. Weights must be carefully chosen, as trying to lift overly heavy weights can cause damage, but when done right, this type of exercise will increase bone density, drastically reducing your chances of developing osteoporosis. It will also increase muscle mass - which women naturally start losing as they enter perimenopause, a process that is partly responsible for weight gain. Weight training should be available at your local gym, or done at home. Weights don't have to be specially bought - bottles filled with sand or water will suffice. The psychological and physical symptoms of perimenopause may be unpleasant, but they are not inevitable. A sedentary lifestyle can intensify problems, and so incorporating one or more of these sports can help, making perimenopause a more comfortable transition. 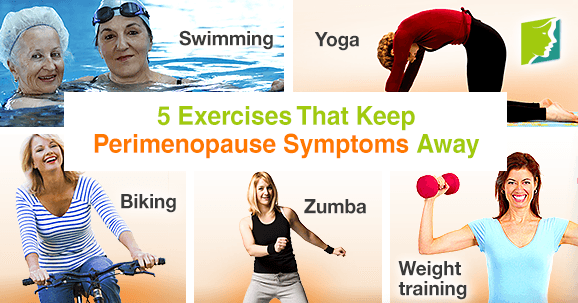 Regular physical activity can combat perimenopause symptoms. Click here to how to master 5 moves that will chase symptoms away.